Alexa, the great attention getter! Amazon.com owned Alexa, who claims to have had over 10 million downloads of its search tool bar since 1997, is here to help you get the attention of your client who is ignoring you. To do this you will use their site in a way it was not originally intended. Alexa provides a nifty chart making interface that allows you to type in the names of up to five web sites, hit the "compare sites" button and zingo! a comparative web traffic chart appears. Cool! Alexa's traffic rankings are not based on actual site usage reports but on the usage patterns of Alexa Tool bar users over a rolling 3 month period. 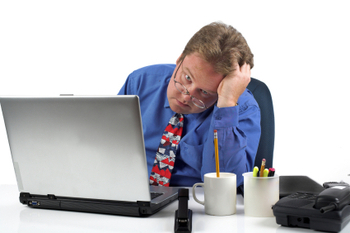 A site's ranking is based on a combined measure of reach and page views. As with any system like this the larger the traffic on the sites you are tracking, the more accurate. For small sites with light traffic accuracy can be questionable. This traffic measurement tool is a good way to compare your sites traffic with competitive sites. But there is a better way to use it. Many of your clients care more about their competition than their customers, and all of your clients want to hear more about their competition than what you are trying to sell them. So use Alexa to compare your customers site traffic to those of it's competitors. The chart above, compares site traffic of Best Buy, Circuit City, and Shoplocal. Don't ya think the media the buyer at Circuit City would find this interesting? Hey look at that big post Thanksgiving traffic spike. 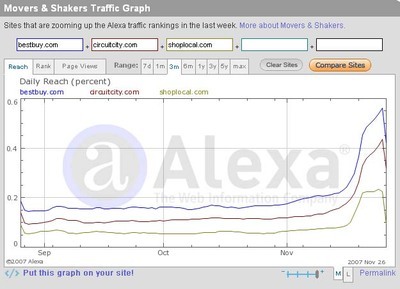 How come the Thanksgiving spike did not carry Shoplocal.com as far? This will be a great conversation starter. Then comes the logical question to ask the Circuit City media buyer..."Do need more expose through your offerings to compete with Best Buy?" Go to Alexa.com and type in the name of the client you want to call on and their competitors. Now you can start a dialog with some information they will want to see!